WEATHER OR NOT.....GLOBAL WARMING? USE THOSE WOOL QUILTS AS WALL ART INSTEAD! Climate change is on everyone's mind - global warming, sea levels rising, shorelines eroding, and so much to fret about all around the world. 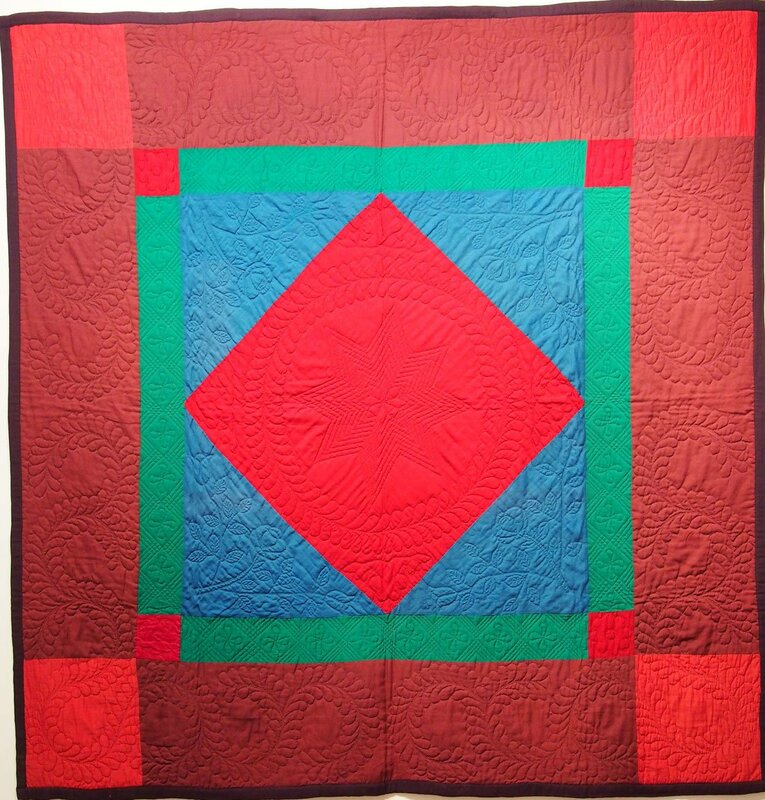 Did you even know that many antique American quilts were made of wool too? With their intense color saturation thanks to 19th century advances in dye technology, and the mostly geometric graphic compositions of their piecing (few are floral or pictorial), wool quilts of the 19th and early 20th century are the infrequently heralded treasures in any analysis of quilt artistry. Most people think of quilts as made just of cotton (and sometimes silk for fancier ones), without realizing that there is an enormous, varied heritage of antique wool quilts primarily from the United States that we can appreciate now with new esteem in light of the current climate (pun intended). Since the beginning of her antiques career Laura Fisher of FISHER HERITAGE has sought out quilts pieced of wool as the more exciting and uncommon discoveries to be found among the thousands of antique quilts come to market around the bicentennial and subsequently. There's still time to send something personal to the British-American couple soon to marry (in addition to a charitable contribution they suggest). How about an antique quilt, a jacquard coverlet, a textile or a hooked rug that has an English-American connection, to underscore their union? An antique textile's visual appeal and historic back story, having originated during the 19th or 20th century, makes such a choice a meaningful gift for this or for any modern couple. In the case of Laura Fisher's FISHER HERITAGE gallery (by appointment in New York), it would continue a tradition of providing an antique American gift for English royalty that began with Prince Charles. 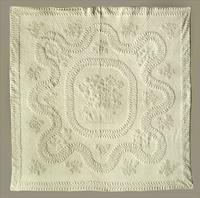 He chose as a wedding gift a jacquard coverlet with a political inscription block about American Independence related to the time of his favorite king, George III (and at same time chose a Princess Feather quilt for Diana, and a Whig Rose quilt for another lady (Camilla, oh my my!). Years later Wills and Kate received wedding and baby gifts from clients of Laura Fisher's shop also. An antique 10' long shawl in a Scottish tartan or in authentic paisley, is lovely both to drape or to wear. Either type is familiar adorning royalty in myriad English period portraits. 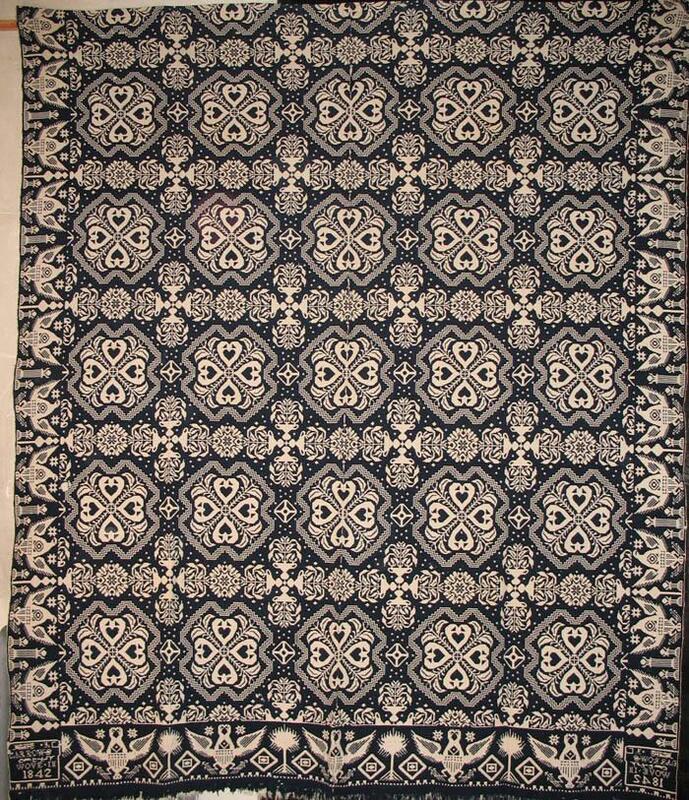 How about choosing from mid-19th century jacquard double weave coverlets created by British weavers who emigrated to New York State, settled in New Britain, and developed their trade here? Their superb quality woven output, some 170 years later, remains in excellent condition and much admired. 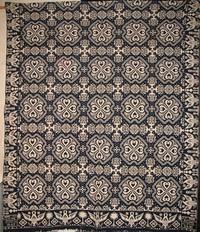 Among the many geometric, floral and pictorial hooked rugs fashioned often in the Canadian east coast and maritime provinces, an apt example for the couple might be the bold crown that had been created for the first North American visit of Queen Elizabeth. In addition to American quilts, Fisher also carries English quilts, English ‘Marseilles’ white woven bedspreads, and hand knit bedspreads beloved by Englishwomen. .
* and the most unique, extraordinary gift, made by a British sailor from military uniforms that depicts the Commonwealth countries to which he sailed, with pictorial medallions, thousands of tiny pieces, and a border of tiny flowers showing the seasons. Has been published and exhibited. Nearly sixty remarkable artworks and insightful texts illustrate the significance of contemporary Black artists working in the southeastern U.S. This exhibition will present thirty paintings, sculptures, drawings, and quilts by self-taught contemporary African American artists to celebrate the 2014 gift to The Metropolitan Museum of Art of works of art from the Souls Grown Deep Foundation. The artists represented by this generous donation all hail from the American South. The golds, reds, and burnished earth tones we exult about in the landscape appear also in graphic pieced quilts, hooked rugs, and woven coverlets of the 19th century. Laura Fisher's FISHER HERITAGE collects a bounty of them annually to enrich that season. Almost as a welcome to the neighborhood, the Edward Thorp Gallery invited me to curate its exhibition TEXTILES: American Quilts & Coverlets . 19th & 20th Century. 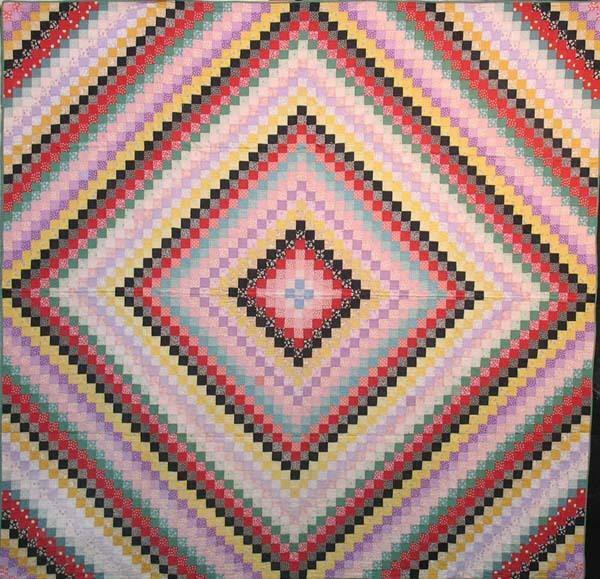 This is the first time in decades that a fine arts gallery in NYC is presenting antique quilts as the art form they are. On view are about two dozen distinctive quilts chosen for their visual impact and technical skill, with their historic component a bonus for viewers. The selling exhibition was on view from April 25 through June 7th, Tuesday through Saturday from 11 to 6. Contact me at 917/797-1260. for details. We just moved to a warehouse in Chelsea! After being midtown East Side for years, we are now in an appointment-required location in Chelsea, the terrific art gallery district. We are on Eleventh Avenue one block from the High Line Park entrance at 26th Street, and also one block in from the Hudson River. An appointment is absolutely necessary, so please call 917/797-1260 a day or two in advance so we can plan to greet you downtown. American Quilts from the Terasaki Collection, at the Herbert Johnson Art Museum, Cornell University, Ithaca, NY. Quilt with Harvest Sun Pattern, American, nineteenth or early twentieth century, cotton, pieced. Collection of Etsuko Terasaki. Photo credit: David O. Brown, courtesy of the Herbert F. Johnson Museum of Art, Cornell University. This exhibition features twenty-one American quilts from the private collection of Etsuko Terasaki, a former professor of Japanese literature and theatre at Cornell University, whose fascination with color and design dates back to her childhood in Japan. 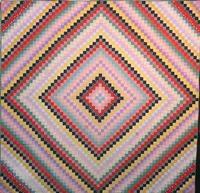 Nearly forty years ago, Terasaki saw her first American quilt and soon after became an avid collector. With an eye for quality in design and craftsmanship, she built a stellar collection that at one time included nearly 300 quilts. 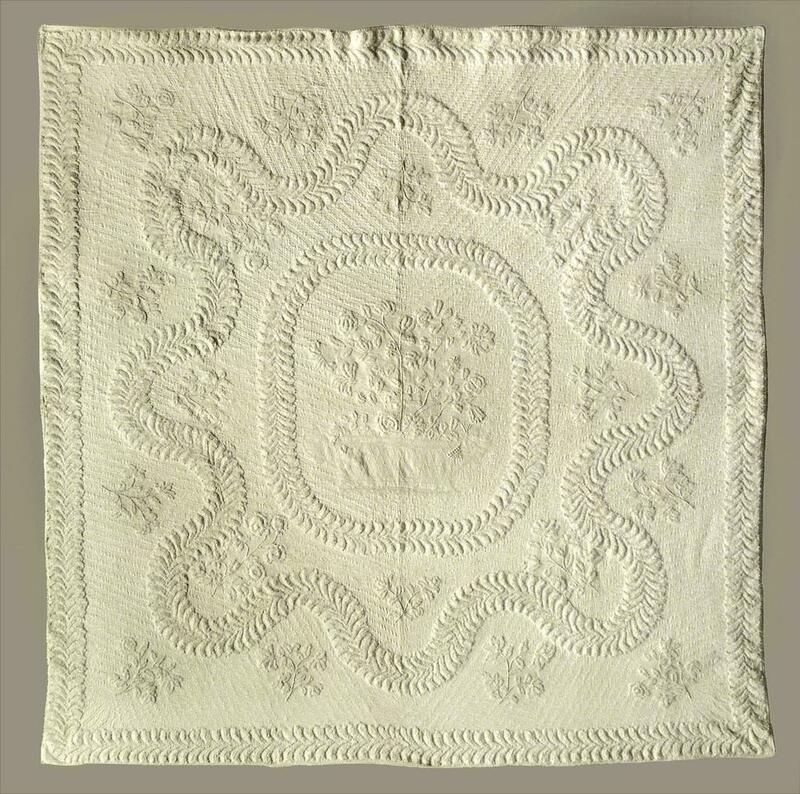 The exhibition includes highlights from that collection, featuring pieced quilts made in America in the nineteenth and early twentieth centuries. Sophisticated in design, these quilts testify to the timeless human impulse to create order and beauty in our surroundings, with whatever resources available, for utility and for pure visual pleasure. The exhibition was organized by the Herbert F. Johnson Museum of Art at Cornell University, Ithaca, N.Y. The exhibition was curated by Cathy Rosa Klimaszewski, Associate Director for Programs / Harriett Ames Charitable Trust Curator of Education.